Standardized modular containers would address inefficient packaging. (Phys.org)—The Physical Internet – a concept in which goods are handled, stored and transported in a shared network of manufacturers, retailers and the transportation industry – would benefit the U.S. economy and significantly reduce greenhouse gas emissions, according to a new study by engineers at the University of Arkansas and Virginia Tech University. If 25 percent of the U.S. supply chain operated with such an interconnected system, profits for participating firms would increase by $100 billion, carbon dioxide emissions from road-based freight would decrease by at least 33 percent and consumers would pay less for goods. "Our results indicate that the Physical Internet represents a virtuous cycle in which manufacturers, retailers and transportation providers all benefit in terms of increased profit margins and smaller environmental footprints," said Russ Meller, professor of industrial engineering and director of the Center for Excellence in Logistics and Distribution. "The transportation network that is anticipated to emerge will also create better network design and customer service and will help address the problem of driver shortages and turnover." Currently, the transportation industry – with an economic value of trillions of dollars annually – is mostly a segmented enterprise with roughly three-fourths of manufacturers or retailers transporting their own goods without integrating or combining logistics with other carriers, manufacturers or retailers. Although there has been some success at integrating resources, most manufacturers still transport their own goods, a wasteful and inefficient process. According to U.S. Department of Transportation statistics, average truck-trailer loads are less than 60 percent full, and at least one out of every five – and possibly one out of four – trips is made with an empty trailer. This means that overall efficiency rates are no greater than 50 percent. This problem has a significant impact on the U.S. economy and the environment. In 2007, road-based freight carriers consumed nearly 30 billion gallons of fuel, and from 1990 to 2008, carbon dioxide emissions associated with road-based freight carriers increased by nearly 15 percent, up to 517 trillion grams per year. As a potential solution, the Physical Internet proposes an efficient system in which global supply-chain logistics are enabled by an open, intermodal (transportation by land, rail, ship or barge) system that uses standard, modular and re-usable containers, real-time identification and coordinated routing through shared logistics facilities. In other words, all supply-chain stakeholders – manufacturers, transportation providers and retailers – act independently to use a shared logistics network that increases the size of trailer loads and reduces or eliminates miles traveled by empty trailers. Meller, holder of the James and Marie Hefley Professorship in Logistics and Entrepreneurship, and his research colleagues developed models to quantify the effects on profits and sustainability if industry stakeholders shifted to a fully interconnected logistics system. They focused on principal potential participants – consumer-packaged-goods manufacturers, retailers, diversified manufacturers/shippers and transportation service providers. They used their results to predict the impact of the Physical Internet on key performance indicators and to motivate organizations to consider moving toward adoption of the system. The models showed that the Physical Internet would increase stakeholder profits by $100 billion annually and would reduce annual carbon emissions from road-based freight by more than a half,. These are conservative estimates, based on only 25 percent of all freight flows in the United States. The researchers also were surprised by their discovery that the shift toward a shared system would lead to more inventory holding points located closer to customers than the current distribution centers. One major consequence of this shift, Meller said, would be more predictable short-haul or relay shuttle runs, rather than the prevailing point-to-point or hub-and-spoke designs used today. These shorter runs would have many positive consequences – higher profits for stakeholders, savings for consumers, better customer service and lower driver turnover rates. "We predict that a relay network would get drivers home more often, which we believe would drastically reduce driver turnover," said Kimberly Ellis, engineering professor at Virginia Tech and co-author of the study. Finally, the research showed a net reduction in prices paid by the consumer. "The technology to make this happen is currently available," Meller said. "All parties, including the consumer, will benefit. Now we need industry partners to pilot a mini-Physical Internet and allow us to share those results with others in the industry." The researchers' results are part of a two-year project sponsored by the National Science Foundation and 18 industry leaders. "This research clearly shows how fundamental changes to logistics procedures and infrastructure can have significant impact on costs, equipment utilization, driver retention, customer service, fuel consumption and pollution," said Jim LeTart, marketing director for RedPrairie, an industry partner headquartered in Alpharetta, Ga.
"Phase I of the Physical Internet initiative proved that there is real potential to fundamentally change the way we move objects in the physical world, where everybody wins in a dramatic fashion," said Frank Broadstreet, senior director of engineering services for J.B. Hunt Transport Services Inc.
A final report can be downloaded at the project's website (faculty.ineg.uark.edu/rmeller/ … LDi-PI/index-PI.html.) The researchers hope to find partners for the second phase of the project, in which they will focus on pilot studies in the industry. Did they take into account the "big box syndrome" that is already present in courier services? Like in the actual internet, you don't always have enough data to fill a MTU and you lose throughput efficiency. The problem is that the delivered amounts and sizes of objects can vary wildly, making the development of a standardized container impossible. It's already true: if I order some product from, let's say Germany, it will arrive in a 3x3x3 ft box regardless of its size, and 95% of the space will be either empty or some sort of unnecessary packaging material. It's already happening. It's called UPS. 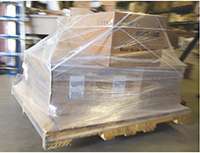 Speed of delivery is a concern, as is increased handling and the resultant shipping damage. Freight lines already interchange, as does UPS and Fedex and USPS - heck I'm guessing they all do to some extent. I can see where this idea looks good on paper, but in the real world, not so bueno.